2)Apply Jam on the pieces and cover each piece with another , cut the bread slices into 4 pieces and keep it aside. 3)Boil the milk ,when it reached the boiling point, add condensed milk and sugar and keep stirring. 4)Add cornflour mixed with 1/4cup of milk keep stirring as it the milk might thicken too quickly. 5)When the desired thickness has reached, add vanilla essence and stir to mix it well. 6) Remove the milk pan from stove and allow it to cool. 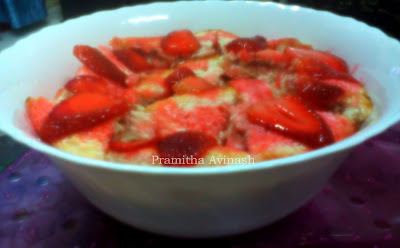 7)When cooled ,pour 2 large spoons of the thicken sauce in a dish and arrange the bread n jam pieces than layer with sliced strawberries and strawberry syrup,over that again sauce . 8) Repeat this step until all the bread pieces and milk mix has finished.